Only one home game left this season and we only have two more Sunday afternoons to go. Open today from 1 Pm until 5 Pm and Friday from 7 Pm. We are also open next Saturday from 4:30 Pm. 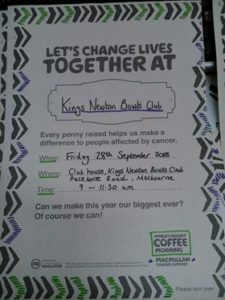 Coffee Morning 28th Sept 9:00 am. We are open today from 10:30 until 5 pm. We are then open every weekday except Thursday from 7 pm and open Saturday from 4 pm. All welcome including non -members.